Gun Gordillo “INFINI,” 2019. Photo: David Stjernholm. It is a great honor to present 'INFINI', Gun Gordillo's third exhibition at the gallery. The exhibition will present new work by the artist, which has been conceived with inspiration from several recent large commissions and our solo presentation of Gun Gordillo at Artissima in Turin, 2018. 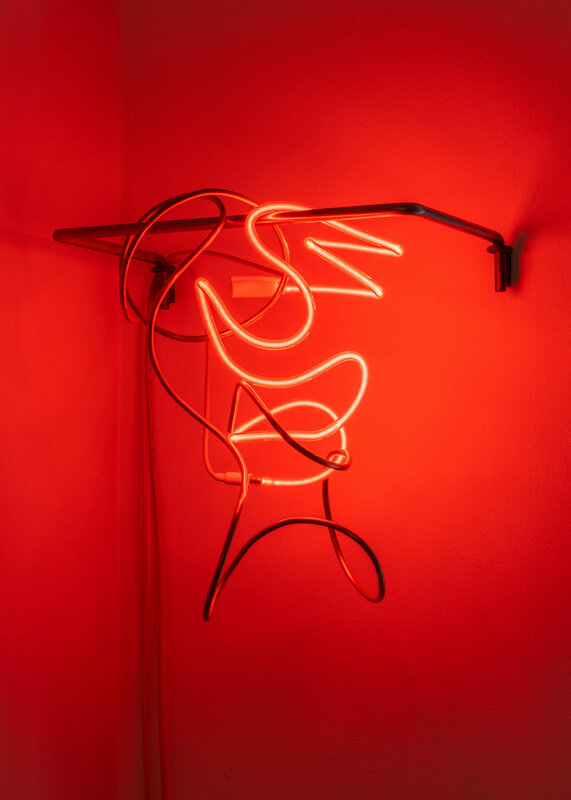 Gun Gordillo works with light and space, but where the steel rods previously mainly were used to create the shapes for her neon tubes, it has now become a frequent sculptural element in her work, alongside with the light. The first work to be created in this way was ‘Vide’, which was part of her latest exhibition at the gallery, titled ‘For F’. The light is also completely absent in some of her new work, in the new mobiles conceived in mirror polished steel, copper, brass and blue steel, which reflects the light from other work and the surroundings. Furthermore, Gun Gordillo has created some of her most complex light sculptures to date, with the wall-hanged works ‘Rouge’ and ‘Bianca’. Common for all of the works is that they still, after a career of more than 40 years, contain an element of playfulness, and a perpetual research in material, light, warmth, cold and space. The shape seems more unconstrained than ever. Gun Gordillo investigates materiality and tolerances, and makes the delicateness in the light a force in her language, together with the tough materials which she also uses in her work. The neon light and mirrors create a further dimension in the works, space and movement and different impressions depending on the context and the time of the day. Gun Gordillo lives and works in Copenhagen and has concurrently lived for 20 years in Paris. She has exhibited in most of the world, e.g. with Denise Rene in Paris and Ernst Beyeler in Basel, at Art Basel, Lund’s Konsthal, Wanås Sculpture Park, Århus Kunstbygning, Cisternerne, Munkeruphus, Chamber (New York) etc. She has made large scale commissions for Hötorget T-Ban station in Stockholm, Jacob Burchardt Haus in Basel, VIA University College in Aarhus (2018), KBB on Kalvebod Brygge in Copenhagen (2018) and many others. Gun Gordillo received The Niels Wessel Bagge Grant in 2018. Opening: Friday, March 22nd, 5-7 pm. Opening hours: Tue-Fri: 12-17, Sat: 11-15 or by appointment.